A UNISEX super flexible Split Sole Tap Shoe. Man made uppers and sole with single strap buckle. Full length padded plush sock lining. Cushioned heel counter for maximum comfort. Nonskid traction pad. 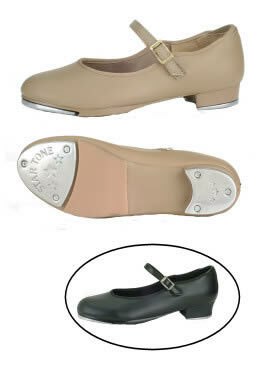 Toe and heel taps are secured with resonating boards. Heel graduates from 1/2" in child to 1" in adults. Manufacturer suggests ordering the same as your regular street shoe sizes.